If cooking rice makes you nervous, know that you are not alone. Even really seasoned and confident cooks get intimidated by plain old rice. But making perfect rice is well within anyone’s grasp. And if you have kids, you probably know how much kids like rice. It’s ideal for soaking up sauces, balancing out spiced or spicy main dishes, and when all else fails, it’s what a picky eater will eat. This is how to make perfect white rice. American long-grain white rice is the most familiar rice in American kitchens. It's usually cooked in a tightly covered pot with a measured amount of water, which gets completely absorbed by the rice, resulting in a dry, fluffy texture with distinct grains. The basic recipe is 2 to 1, in terms of water and rice. You can easily, double and even triple the recipe; make sure you are using a pot large enough to hold the rice as it will expand a bit when cooking. Other rice varieties, like brown and Arborio, can be a little different in terms of proportions and timing, but this is how you’ll get perfect white rice every time. 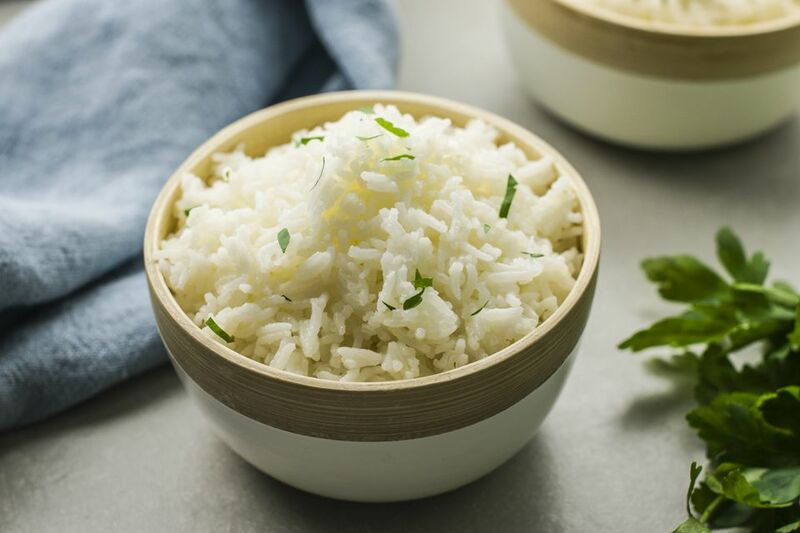 Rice keeps well in the refrigerator for up to 5 days, so you can make extra to serve later in the week, or to use in different dishes, like stir-fries or frittatas. Bring the water to boil in a medium saucepan. Add the salt and butter and allow the butter to melt. When the water has returned to a boil, stir in the rice. Let the water return to a light simmer. Stir again, cover the pot, and turn the heat down to low. Keep the rice simmering slightly, and keep the pot covered (you may have to peek after a few minutes to make sure the heat is at the correct temperature, but then let it cook, covered). Start checking to see if the rice is tender and all of the liquid is absorbed in about 17 minutes. It may take up to 25, especially if you are making a larger quantity of rice. When the rice is cooked, turn off the heat and let it sit for another couple of minutes to finish absorbing any liquid. Take off the lid, fluff the rice with a fork, and let it sit for another 2 minutes so that some of the excess moisture in the rice dries off. Serve with your side of protein and enjoy! If you're making rice, keep in mind there are so many different varieties of rice to explore these days. Companies like Bob’s Red Mill and Lundberg offer great rice options, so once you get the hang of basic white rice, you’ll have plenty of other versions to explore. The colors and shapes and flavors can be very different, and it’s fun to think about how to pair them with different dishes.